Thousands Getting Their Grids On! And they're off! New Year's Day January 1 (UTC) marked the opening day for the ARRL International Grid Chase 2018 (IGC). Among those hitting their grids running was newly minted General-class operator Katie Thompsen, KI7HCX, of Mt. Vernon, Washington, who used the occasion to embark on the Chase and to get on HF for the first time using her own call sign. The 11-year-old comes from a ham radio family. Her dad, Todd, is W7TAO, while her older brothers are Mason, K7MWT, 15 -- who upgraded to Amateur Extra at the examination session where his sister upgraded to General -- and Tanner, K7TMT, 13. "She called CQ Grid Square Chase on 20 meters and very quickly made 44 contacts," her dad told ARRL. "She was very excited to work her first pileup and even had two Japanese stations QSO with her. She's anxious to continue participating in the grid square chase." Todd Thompsen said all three young radio amateurs are looking forward to participating in Rookie Roundup in April. The IGC is off to a rousing start, with some 6,400 participants from around the globe already showing up on the Leader Board as of the morning of January 4. Point totals for the International Grid Chase are shown for confirmed contacts only, and, while the leader boards are not based on real-time data, they are updated several times a day. All contacts on all bands except 60 meters are valid for Grid Chase credit, provided both stations upload their logs to Logbook of The World (LoTW) and get a match. The objective of the year-long event is to work stations in as many different Maidenhead grid squares as possible, and then upload your logs to LoTW. Each new grid square contact confirmed through LoTW will count toward your monthly total. Stations do not have to exchange grid squares for a valid contact, although it's anticipated that many operators will do so. Some rare grid squares will be in demand. How about yours? Get on the air, and get behind your grid! If you can, get out there, and activate the scarce ones. Members of the Marconi Cape Cod Radio Club KM1CC at the Cape Cod National Seashore will activate rare grid square FN51 January 18-19 for the International Grid Chase. Nathan "Chip" Cohen, W1YW, of Belmont, Massachusetts -- the founder of Fractal Antenna Systems Inc and inventor of the fractal antenna -- has been granted a patent for deflective electromagnetic shielding -- essentially "cloaking" technology to defend against detection by radar and similar technologies. "Ham radio experimentation can lead to some pretty cool innovations!" Cohen said in response to a recent QRZ forum post about the patent. "Let's keep that spirit alive in 2018." 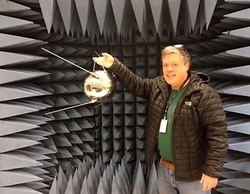 Chip Cohen, W1YW, makes use of a Sputnik 1 satellite model during a demonstration. "Much time and effort has been devoted to the quest for so-called invisibility machines," the patent's background information states. "Beyond science fiction, however, there has been little, if any, real progress toward this goal." According to the detailed description, the technology "provides one or more surfaces that act or function as shielding and/or cloaking surfaces for which at least a portion of the surface includes or is composed of 'fractal cells' (small fractal shapes, functioning as antennas or resonators) placed sufficiently close to one another, so that current present in one fractal cell is replicated or reproduced to an extent in an adjacent fractal cell. Without being limited by any theoretical explanation, surface plasmonic waves are believed to cause such replication in conjunction with evanescent waves." The resulting surface would deflect around an object. In terms of backscatter, upon which radar systems depend, Cohen has explained it this way: "The incoming wave reflects off a boundary condition at the object. Its reflection is out of phase and phase-cancels with the incoming wave. Bye-bye, backscatter." Fractal Antenna Systems first publicly demonstrated "person invisibility" in 2012 for a Radio Club of America audience. He also has demonstrated invisibility cloaks at Hamvention® and at the ARRL New England Division Convention. According to the company's BusinessWire release, "Uses of the newly patented technology extend to commercial needs such as towers, antennas, people, and shielding, but it may also be used in defense and intelligence arenas." Not invisible: Chip Cohen, W1YW, holds his 5BDXCC plaque at ARRL Headquarters. The BusinessWire release said the technology "produces the desired effects without any requirements on special orientation, composition, or shape of the object. The cloak/deflector can be very thin, and the effect can happen over a wide bandwidth." The company noted that cloaking applications concentrate on microwave and infrared wavelengths, but the technology and patents also apply to visible light. "Cloaking at visible light has limited needs," Cohen has said. "Camouflage and projection methods are easier and cheaper at making something disappear to the eye. But at radio and heat wavelengths, the cloaking technology is an important enabler." Cohen, 62, applied for the patent in 2012. An ARRL Life Member and active DXer, he has been a radio amateur for more than 50 years. "Keeping Cool -- the importance of maintaining proper equipment temperature" is the topic of the latest (January 4) episode of the "ARRL The Doctor is In" podcast. Listen...and learn! The 3Y0Z Bouvet Island DXpedition team announced in late December that it had reached "yet another milestone" in its quest to activate Bouvet Island, the second most-wanted DXCC entity (behind the Democratic Republic of North Korea), in January and February. A dependency of Norway, Bouvet is a subantarctic island in the South Atlantic. This major DXpedition could get under way as early as January 23 or 24, and the crack team of operators hopes to spend 14 to 16 days on Bouvet, depending on weather and other factors. Bouvet has not been activated for about a decade. The DXpedition said it would transfer nearly $500,000 to DAP, the Chilean company that owns and operates the M/V Betanzos and the helicopters that will provide transportation. That single outlay points up the extraordinary expense of mounting a DXpedition such as this. In August, the Northern California DX Foundation (NCDXF) announced its largest contribution ever -- $100,000 -- to the 3Y0Z Bouvet Island DXpedition. 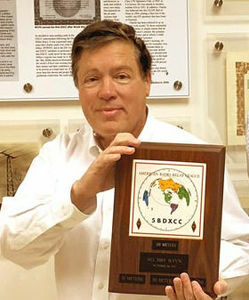 The ARRL has granted a Colvin Award to help support the DXpedition to the second most-wanted DXCC entity. The DXpedition has benefited from many other club and individual donations and continues to invite contributions to defray its significant costs. The 3Y0Z team, which consists of 20 highly experienced radio amateurs, said it's on schedule for a January 13 departure to Bouvet Island, "the most remote island on Earth." Team members will gather in Punta Arenas, Chile, by January 10, attend a day-and-a-half marine safety course, purchase last-minute supplies, and then fly across the Drake Passage to King George Island in the South Shetlands, where they will board the newly refurbished Betanzos for an approximately 10-day voyage to Bouvet. "Sea ice has been reported along a direct route to Bouvet, and that may dictate we take a more northerly course, before turning east to approach Bouvet. That may add day or two to our transit time," the December news release said. The newly refurbished Betanzos will transport the 3Y0Z team from the South Shetlands to Bouvet Island. Two helicopters will transport the team and gear to and from Bouvet. "There has been a thorough review of landing procedures and shelter and antenna layouts," the news release said. "We have three alternative anchoring systems to secure the shelters and antennas to the ice on the surface of Bouvet. So, the plan remains unchanged." 3Y0Z anticipates "a propagation-driven operation," with two high-power stations on every open band using gain and directional antennas. Primary modes will be CW, SSB, and RTTY. FT8 will be utilized if it is the only productive mode. The Bouvet team advises FT8 enthusiasts to read the 3Y0Z FT8 protocol on the Band Plan page. The website includes complete information on band plans and frequencies, propagation predictions, and QSL procedures. The 3Y0Z team leaders are Bob Allphin, K4UEE; Ralph Fedor, K0IR, and Erling Wiig, LA6VM. Among them, the Bouvet DXpedition leaders hold 11 DXpedition of the Year awards, have activated a dozen Top 10 DXCC entities. Reminiscent of underwater footage from a TV documentary about the discovery of a long-lost vessel, a recently posted YouTube video that takes a deep dive into the innards of former Hamvention® venue Hara Arena has been attracting notice within the Amateur Radio community. The narrated video probe was posted on December 22 by Once Occupied, an urban exploration group that originated in Dayton, Ohio. It's not the first video of the derelict Hara Arena since it closed -- and since anything thought to be of value inside was auctioned off. The IRS put the Hara Arena complex itself on the auction block last August to satisfy a tax lien, but there were no successful bidders. The Hara Arena complex was closed in August 2016. It's not clear whether the three-person Once Occupied expedition had permission to be inside Hara Arena nor how the individuals, who do not identify themselves, gained entry to the building complex. Among the more fascinating revelations was how much equipment, event paraphernalia, and just plain debris remain inside the 165,000-square foot Hara complex, which included an apartment. "This is creepy and surreal, but I couldn't turn it off and had to watch the whole thing," allowed Pete Varounis, NL7XM, the QCWA's official call sign historian, who shared the video with his colleagues on the QCWA board of directors. "You will recognize entire areas that teemed with activity during every Hamvention," he continued. "It looks like raw footage from Chernobyl after the Russian nuclear disaster." The urban explorers were a bit more mundane. 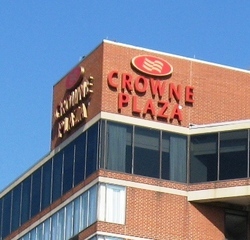 "The facilities include a bar pub, ballroom, conference center, ice rink, and four exhibition halls. This place is huge!" the narrative posted with the more than 20-minute video clip related. 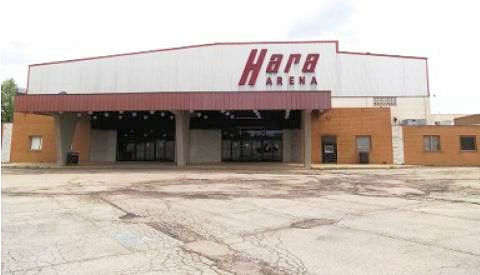 As the Once Occupied team noted, Hara Arena over the years played host to sports teams and top entertainers -- including Elton John and the Rolling Stones -- as well as to Hamvention, which relocated to the Greene County Fairgrounds and Expo Center in Xenia last year after Hara closed in 2016. 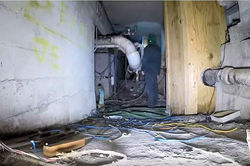 Much of this particular video covers parts of Hara Arena never seen by Hamventioneers -- including catwalks, tunnels, and behind-the-scenes rooms and facilities such as offices, kitchen areas, and storerooms, some of which still contained unopened goods and supplies. File cabinets still store paper files, and abandoned computer and other equipment is scattered about. At least one box the group encountered contained new T shirts for a sports team that once made its home at Hara Arena. Some areas of the building's interior seem to have been hit by a tornado. The explorers do not appear to take anything from Hara Arena or disturb what remained behind. "Our passion is exploring abandoned places. We explore because we love adventure and the thrill of the hunt," Once Occupied says on its Facebook page. "Documenting our journeys through digital media allows us to share the stories of the past." The group warns that such urban exploration is not without risk and "not for everyone." Hara Arena's future remains in limbo. An IRS staff member who was involved in the 2017 auction told ARRL that the agency will not put Hara Arena up for auction again but said there is "a lot of interest in the property." She said other lien holders, including a mortgage holder and the Town of Trotwood, eventually could get the opportunity to put the building on auction in an effort to satisfy their liens on the property. The second-annual AM Rally is inviting operators to explore the original phone mode over the February 2-4 weekend. Co-sponsor Clark Burgard, N1BCG, said the event "is intended to be both fun and educational." It encourages all radio amateurs to get on AM, possibly for the first time. "Because of resurgent interest in AM, the event is also an opportunity for amateurs new to AM to learn about proper settings and get the most performance out of their station, whether it's modern, vintage, tube, transistor, software-defined, military, boat anchor, broadcast, home brewed, or commercially made," Burgard said. The AM Rally website includes tips and suggestions for various transmitter types as well as links to additional information. Certificates will be awarded for most states contacted and most contacts overall made by stations in five power-output classes. Some "special recognitions" will be made on an ad hoc basis, Burgard said. The AM Rally gets under way at 0000 UTC on Saturday, February 3, and concludes at 0700 UTC on Monday, February 5. Band include 160, 80, 40, 20, 15, 10, and 6 meters. The 2017 AM Rally, which was held in April, was deemed a huge success, with nearly 1,500 contacts reported on the 72 logs submitted. Philippines Amateur Radio Association's (PARA) Ham Emergency Radio Operations (HERO) volunteers assisted with emergency communication support in the wake of two severe weather events. Tropical Storm Kai-tak -- known locally as Urduja -- hit first in the central Philippines on December 16, leaving nearly dozens dead and forcing others to evacuate. It was followed on December 22 by the more-severe Tropical Storm Tembin -- known locally as Vinta -- which caused significant damage and claimed some 200 lives in the southern Philippines. Hundreds more are reported missing. Roberto "JoJo" Vicencio, DU1VHY, said HERO volunteers provided HF coordination through a national emergency net at 7.095 MHz. In addition, local clubs embedded with government responders used designated channels and club frequencies. 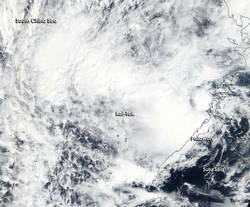 According to Vicencio, TS Kai-Tak ravaged the Central Visayas area, holding in place for nearly 3 days. "Much rain was dumped in the Samar and Tacloban areas of the Central Visayas region," he said. "In situations like this, most radio amateurs in the affected areas fold into the government's regional/provincial disaster risk-reduction management offices to consolidate the actions of the amateur and civic groups as well as the military and police forces." "There was a shortage of communications too," Vicencio reported. "Many major transportation arteries were affected, further stranding others who tried to escape." Alabama Governor Kay Ivey made her Amateur Radio debut on December 14 -- the state's 198th birthday -- at the same time becoming the first person to use the state's bicentennial call sign, AL2C. Alabama will celebrate its 200th anniversary in 2019, and AL2C will be on the air for 2 years as part of the statewide celebration. On the Air: Alabama Governor Kay Ivey inaugurates Alabama Bicentennial Special Event call sign AL2C. "I'm very excited to see the hard work that has been in the works for some time now to promote Amateur Radio in concert with the Alabama Bicentennial celebration," said ARRL Alabama Section Manager JVann Martin, W4JVM, who was at the State Capitol for the event. "It was great to activate the brand-new call sign AL2C on Alabama's 198th birthday, and we look forward to many more activities to come as we build up to Alabama's 200th birthday." The Alabama Bicentennial Amateur Radio Club set up a D-Star VHF station in the Old House Chamber at the Alabama State Capitol in Montgomery. 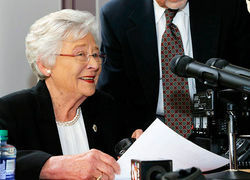 After announcing the Alabama Bicentennial Schools Initiative, Governor Ivey proceeded to the radio station, initiating contact with the Lee County Emergency Management Agency. The governor discussed the Alabama Bicentennial over the air, with Otto Arnoscht, N4UZZ, the AL2C Call Sign Trustee, serving as the control operator. On the other end of the conversation at Lee County Emergency Management Agency was Mike Watkins, WX4AL, the District Delta ARES Emergency Coordinator and Lee County ARES Emergency Coordinator. Read more. The deadline is January 31, 2018 to submit ARRL Foundation Scholarship applications. All applicants must be FCC-licensed radio amateurs, and many scholarships have other specific requirements, such as intended area of study, ARRL Division, Section or state, and license class. Applicants should review the scholarships and check off the ones for which they are eligible. More information is on the ARRL Foundation Scholarship Program page. This year, the Foundation Board of Directors is offering several new scholarships. These include The Old Man International Sideband Society Scholarship; The K6GO Gale Olson and NA6MB Mike Bender Scholarship; The Harry A. Hodges, W6YOO, Scholarship; the Homer V. Thompson, W4CWV, and Annette P. Thompson, W4LKM, Memorial Scholarship; the Shenandoah Valley Amateur Radio Club Scholarship; the Medical Amateur Radio Council (MARCO) Scholarship, and The Ladies Amateur Radio Association of Orange County Scholarship. The 37th annual ARRL/TAPR Digital Communications Conference (DCC) will take place September 14-16 in Albuquerque, New Mexico. Reservations are now open. The Digital Communications Conference schedule includes technical and introductory forums, demonstrations, a Saturday evening banquet, and an in-depth Sunday seminar. This conference is for anyone with an interest in digital communications, from beginners to experts. The TAPR website has more information. The conference invites technical papers for presentation at the conference and for publication in the Conference Proceedings. Presentation at the conference is not required for publication. Papers are due by July 31, 2018, to Maty Weinberg, ARRL, 225 Main St, Newington, CT 06111 or via e-mail to maty@arrl.org. The Conference website has full details and submission guidelines. Nancy Yoshida, KG0YL, has been appointed as ARRL North Dakota Section Manager, effective on January 1. Yoshida, an ARRL Life Member who resides in Thompson, took over the North Dakota Field Organization leadership reins from Lynn Nelson, W0ND, elected in November as ARRL Dakota Division Vice Director. 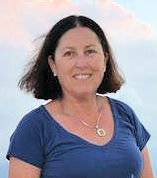 Nelson had served as North Dakota Section Manager since 2008. Yoshida, who was North Dakota Section Emergency Coordinator since 2011, will complete Nelson's term of office, which continues through September. Yoshida, 67, has raced sled dogs since 2002, and in 2009 she ran the Iditarod Sled Dog Race in Alaska. She became interested in Amateur Radio after volunteering for Iditarod communications in 2006, and continues to be involved. Hamvention® 2018 tickets are now available online. "Both Inside Exhibits and Flea Market committees are working hard to have space sales open as soon as possible," said Hamvention spokesperson Henry Ruminski, W8HJR. Hamvention 2018 will take place May 18-20 at the Greene County Fairgrounds and Expo Center in Xenia, Ohio. Tickets are $22 in advance, and $27 at the gate and good for all 3 days. In addition to Hamvention admission, tickets cover parking, all testing sessions, all forums and speakers, and prize drawings.